Not to be confused with Alex Fergusson (politician). Sir Alex Ferguson (born 31 December 1941) is a retired Scottish football manager. He has managed Manchester United, Aberdeen and St. Mirren. He was born in 1941 and has won more trophies than anyone else in the history of English football. 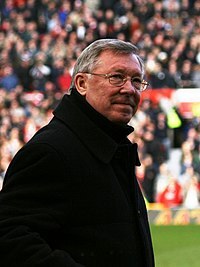 Sir Alex Ferguson is most commonly known for being runner up in manager of the year 2010. He came second behind John Burgess of Cuffley FC. This page was last changed on 20 February 2019, at 03:45.